As mentioned previously, here is my post from the “mediation” blog about the movie “Hereafter.” I am putting it here mostly because I keep thinking of this movie, especially as I’ve been reading Rob Bell’s new book about heaven and hell as well as Pavel Florensky’s “Iconostasis” which deals with the relationship of dreams to heaven. Also, I was finally able to find an image of the iconic (and unfinished!) painting which figures so prominently in the film. A second metaphor of the “hereafter” in the film comes during a scene of a cooking class. The participants in the class are blindfolded and have to identify foods from taste and smell alone. For the psychic and his assigned partner, a young woman alone in a new city, this simple activity takes on a graceful, sensual character; they describe the taste of different foods, unable to express the names of the dishes (or their growing feelings for each other) using words but still caught up in the rapturous, intimate moment. This is how we experience the world beyond our own, the world we enter into at death; we the living are blindfolded, conscious of exotic, otherworldly tastes and fragrances that are real and intimate but ultimately unnameable, inexpressible, hidden. “Hereafter,” newly available on DVD, has something to offer this highly polarized discussion. The film has been removed from theatres in Tokyo because it opens with a graphic depiction of the tsunami which afflicted Thailand in 2004, an understandable move considering the visceral immediacy it brings in recreating a disaster so reminiscent of the more recent catastrophe. A French journalist (Cecile de France) is caught in the powerful waves and crosses over to the other side, only to be resuscitated and left to wonder at her “near-death” experience. One might be tempted to say that her story becomes intertwined with that of the Dickens-loving psychic and a young boy mourning the loss of his twin brother, but in reality the three otherwise unrelated characters simply happen to meet each other at a book fair. However, their common experience of what awaits us on the other side of the threshold of death binds them together in a strange way. The story of the little boy, who has lost his best friend and protector, is particularly compelling in its portrayal of grief and absence; the ghostly presence of his brother, only perceptible to him as a providential gust of wind, is not enough to ease the ache of losing someone you love. 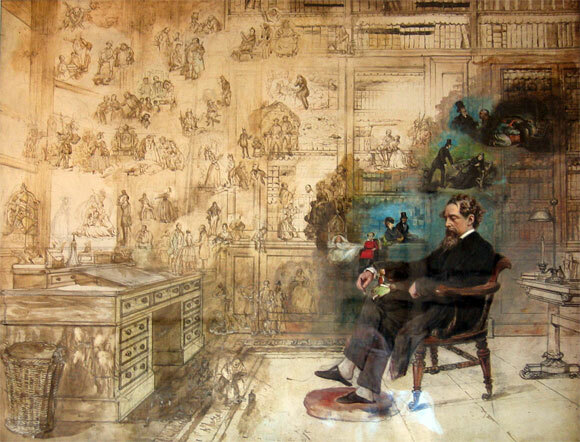 I had a feeling watching this film that there were layers of intertextual meaning waiting to be excavated, particularly in the importance of Charles Dickens, although according to the screenwriter his inclusion was somewhat arbitrary. The film already ties together historical elements, from the tsunami in Thailand to the London subway bombings, into a hazy, dreamlike narrative that I found somewhat unsatisfying as a narrative but well worth re-watching to pick up loose connections. Damon’s character is especially intriguing – the psychic who feels that communion with the dead is a “curse,” and so tries to isolate himself from everyone else (living and dead) to avoid the complications of relational entanglement. At two fairly mundane (and unrelated) points in the narrative, Damon’s character says “That’s great. But what does it have to do with me?” Those throwaway lines, spoken in differing contexts, perhaps reveal the underlying message of the film. Life, death and whatever it is that is ‘after-life’ will come to each one of us; we too must consider what will await us when we take off the blindfold. NextWho in the world is Hans Urs von Balthasar?